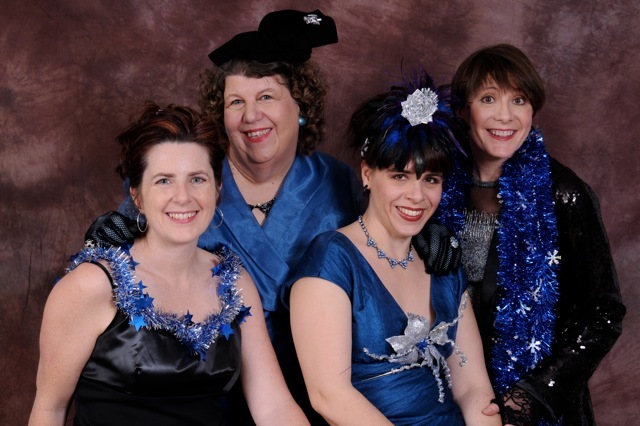 The Hamazons, the improvisational comedy group founded in 1999, consists of Eve Smyth, Cil Stengel, Kyndra Laughery and Carolyn Myers. One summer evening, I joined Eve, Cil and Kyndra around Eve’s kitchen table to kibitz about improvisation, laughter and community. ES: This year we did three shows at Tease Restaurant in Ashland before it closed. KL: People could eat, have some drinks and relax. It was a fun, raucous time doing improvisation. CS: Night-clubby, lots of fun, lots of laughs. EH: Do you usually perform in theaters? CS: The Black Swan, the Community Center, those kinds of things. ES: A few months ago we did a house show. Someone invited a bunch of people to come to their house and asked us to perform. CS: It’s totally fun. Every show is catered to the audience. It’s really wonderful, intimate and personal. KL: Poking fun at human nature. ES: We take suggestions from the audience. We all create the show together. CS: The fact that it’s happening in the moment is what’s special. EH: What are your styles of dress? CS: It’s an ever-evolving list. When there’s a theme, we’ll embrace it. ES: We are the Warrior Princesses of Comedy. CS: Generally we’ve got the glam set, or we’ve got the tribal-wear set. KL: But we don’t condone animal fur. KL: We always invite our audience to dress in reckless abandon. CS: It’s wonderful to look out and see people wearing their feather boas and their jewels — their glam. EH: What keeps you together? We also have different strengths that somehow weave together in this amazingly beautiful way. Kendra is our physical comedienne. KL: Eve’s our storyteller; she’s got the fairy tales. Cil is directing; she has got the map on our improvisation travels. ES: Carolyn has such strong narrative skills and those characters. In our film noir show she played a snake. KL: We all just sort of know how to jump in and make a show complete. EH: Do you have music in your shows? ES: No. All Ham, all the time. EH: Do you get nervous before shows? CS: It’s exactly like jumping off of a cliff. You can’t control it. It’s like stepping into the unknown. KL: It’s a risk-taking arena. Improvisation is really about being in the moment. You need to be listening to what’s happening, and trust one another. EH: How do you rehearse? KL: It’s like a sport. CS: We work out together, not in the gym, but in Eve’s living room. We do warm up exercises and improvisation games. We do exercises that encourage spontaneity, listening and building a story together. We flex our improvisation muscles. It’s not about brawn, it’s more about flexibility. EH: Do you have a message for your audience? ES: Laugh more. We’re talking about community and connecting with each other, with our audience, and with the world outside of our venue. And the more that people are laughing and connecting, the healthier they are, and the happier they are, and the more open they are to the world around them with positive energy. To learn more about the Hamazons, visit www.hamazons.com or call 541-324-3200. Evalyn Hansen is a writer and director living in Ashland.